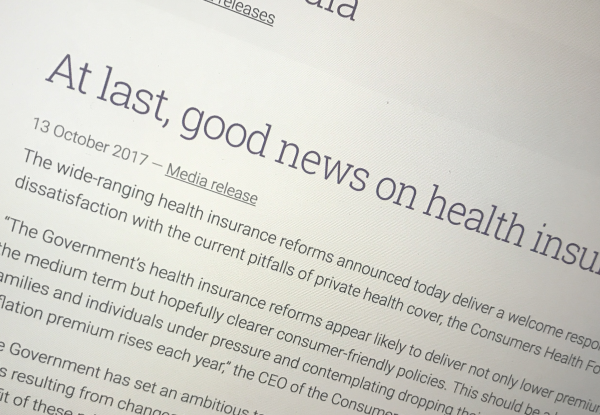 “The Government’s health insurance reforms appear likely to deliver not only lower premium increases in the medium term but hopefully clearer consumer-friendly policies," according to CEO of the Consumers Health Forum, Leanne Wells. The organisation, which represents health consumer organisations, has been a trenchant critic of private health insurance. However, speaking in response to the raft of reforms announced by health minister Greg Hunt, Ms Wells said, "This should be a breath of fresh air for families and individuals under pressure and contemplating dropping their cover after years of above inflation premium rises each year. “The Government has set an ambitious target of around $1 billion in savings over several years for health funds resulting from changes to prostheses pricing. We expect that consumers should receive the full benefit of these price reductions. “Measures including the introduction of simpler categories of policies, and the exclusion of treatments for which there is no evidence are all steps in the right direction. “The significant improvement in access to cover for mental health care is a much-needed provision given the demand for these services and their greater availability in the private sector. “A further positive development is the plan to boost the powers and resourcing of the health insurance ombudsman to assist people to make more informed choices about their policies, and to investigate claims of wrongdoing by health funds. “Enabling improved inclusions in policies for people in rural and remote communities will support those patients needing to travel to the cities for treatment," added Ms Wells.